www.famzoo.com - this is where our public pages (like our home page) reside. app.famzoo.com - this is where our private application pages (like your family’s Overview page) reside. www.google-analytics.com - we use the Google Analytics service to keep stats on which pages in our application are being used most frequently. Its files come from this server. Note that if you sign into FamZoo as a parent, we’ll often show our latest FamZoo Facebook activity in the right hand side bar. (We never show it to kids who are signed into FamZoo.) Usually, the sidebar item will just show some message about it’s content being blocked, but we have seen this interfere with the proper loading of the page in some browsers. In this case, you may have to access your parent FamZoo account from outside your parental controls or from within a parental control account that does not have Facebook blocked. 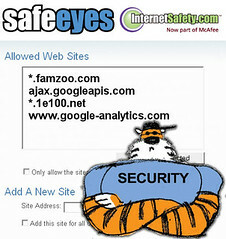 If you add the sites above and still experience problems using FamZoo with safe browsing software, please contact us. We’ll help you get to the bottom of it. Hey, that screen shot looks _very_ familiar. Thanks for your quick response and help!